Whoa! Talk about a tough week for relatively new owners of outdoor chickens – this week has been one of the hardest so far. We had an some unusually cold weather come through the region this week, like much of the country, and it really challenged my thinking on taking care of the ladies. If we step back a short month or two ago, we had some temperatures in the high teens, and at that point in time I chose to attempt to heat the coop with a red heat lamp. It was obvious the birds did not like the light, and I didn’t feel it was helping that much anyhow. When they started talking about single digit temperatures this past week, I was really puzzling over what I would do. We had already insulated the coop with plastic on most inside walls, which helped more than the red heat lamp in my opinion, but it still was not enough for single digit temperatures, at least it wasn’t enough to make me feel comfortable. I wasn’t worried about our hens dying, but I was worried about the Rhode Island Reds getting frostburn on their combs and waddles. They are cold hardy bird, but that exposed skin worried me. The Easter Eggers, on the other hand, do not have much exposed skin, so I wasn’t too worried about them. I spent some time reading up online to see what others had chosen to do, and it seemed I wasn’t the only one suffering from indecision. I think it is because most chicken owners look at their birds as pets that happen to lay eggs. That is certainly how they are seen here. 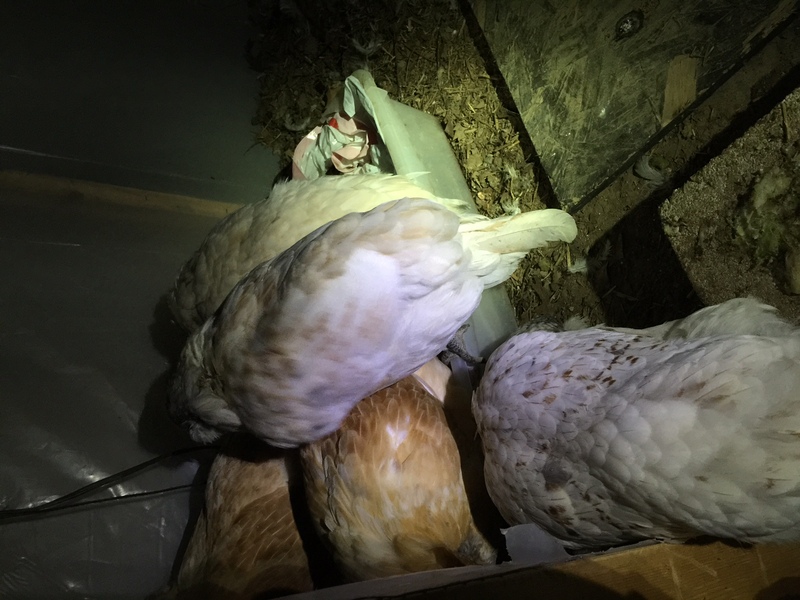 I was able to find references of folks who used the red heat lamps as I had done before, and others who used other heaters, but the resounding message from the experienced chicken owners was that people worried too much. I found examples of people who lived in some very cold places who had never heated their coops, and from what I could tell, if you could keep the wind out and the coop dry inside, the birds would likely be fine. So, I decided that was what I would do. Even so, there was a small concern: water. How would I keep the water from freezing? I decided to use a heated growing mat under their water dish to try to slow down the freezing. When that didn’t seem as effective as I had hoped, we surrounded the water bowl with some insulation (old towels in plastic bags), which seemed to help quite a bit. 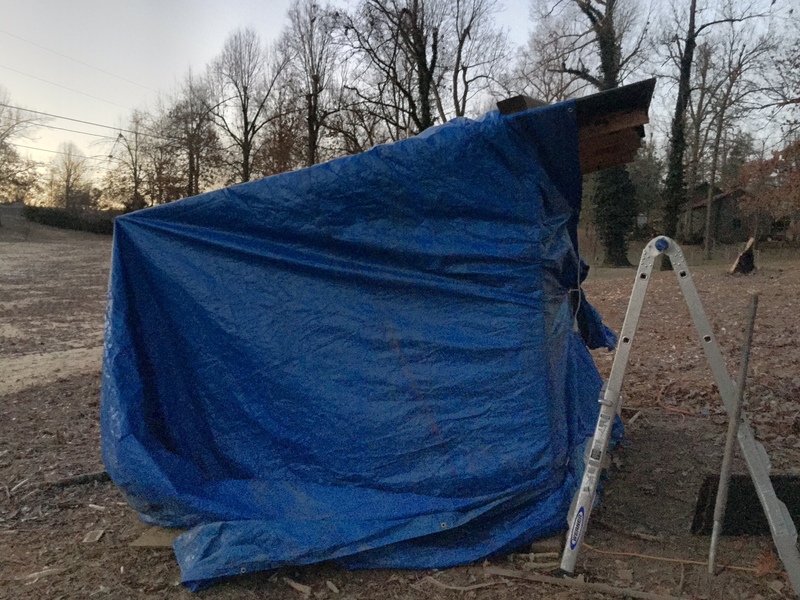 Second, we took a large tarp and draped it over the coop on three sides and part of the fourth. This provided two things: a reduction in airflow and a insulation. I was shocked at how well this seemed to do. Thankfully we had built the coop with enough ventilation at the top that even with three sides covered, there was plenty of ventilation for the moisture to escape. This seems to be one of the largest concerns. I read a great piece of advice that said if you notice frost on the inside walls of your coop, you have too much moisture. We did not notice that at all. After a day or so, I began to be a little concerned at the lack of light in the coop. I didn’t want to introduce the extra heat or risk of fire, but I wanted to add some light in there, so I mounted a fixture on the ceiling and put an LED bulb in it to help with the light. The temperatures did get very cold, with two days being in the singe digits. If it didn’t hit 0° F, it sure came close. When I woke one morning it was 1° F, and I suspect it had been colder. The second wave didn’t get quite as cold, but it was still single digits. The big plastic container is to keep their water from spilling into the coop’s bedding. The heating pad is in the big plastic container. There is a 1 gallon water bowl in the big container, and it is surrounded by towels to hold in the heat as much as possible. The hens are either in the container, on the side, or at the edge. Thankfully this bitter cold spell is over, but I feel better about future cold spells now that we have been through this one. 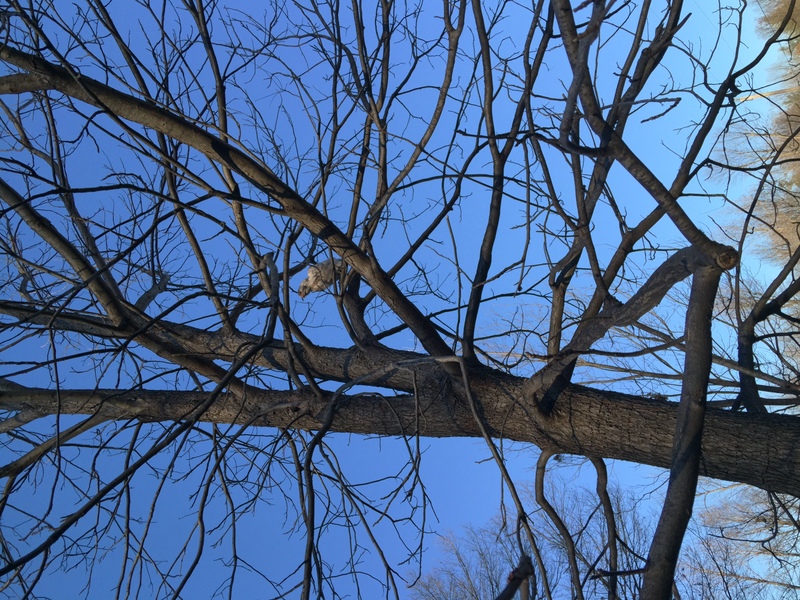 I am sure the birds do too. Oh, even throughout the cold spell, the Rhode Island Reds continued laying, though I think the numbers were a little less than they have been. Perhaps that was due to the decreased lighting for a few days. I show the Rhode Island Reds laid 20 eggs this week, and the Easter Eggers laid 3. Oh, I also had to repair the coop some yesterday. Both doors to the run had boards that had broken which was causing the doors to not be able to be propped open easily. Both are fixed now, though I sure wish they would break in warmer weather next time. This entry was posted in Chickens, Hobbies, Pictures, Uncategorized and tagged in Bitter Cold, chickens, coop, Easter Egger, Easter Eggers, eggs, Flying Chicken, heating the coop, insulating the coop, repairs, Rhode Island Red, Rhode Island Reds, run.